WeDigBio 2018 swag on its way soon! We've amassed a pile of WeDigBio stickers and tattoos for WeDigBio 2018 participants! These will start going out on Sept 24 to those of you who have registered your event by then. We will continue to send swag after that as event registrations are received, but we encourage everyone to register your event soon to ensure receipt! If you are just coming up-to-speed on WeDigBio 2018, check out this blog post from earlier this month. 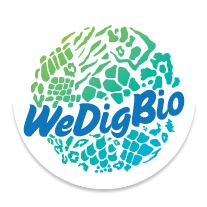 WeDigBio 2018 is Oct 18–21.